Well, space is there, and we're going to climb it, and the moon and the planets are there, and new hopes for knowledge and peace are there." These were the words of President Kennedy in 1962. In less than seven years, on July 20 1969, Neil Armstrong and Buzz Aldrin had set foot on the moon. This year marks the 50th anniversary of that extraordinary achievement. Take a look at the trailer for a new film coming out this year, with never before seen footage of the Apollo 11 launch and moon landing. This half term, we will be using books, poetry, film and music, all with a "space" theme, to inspire our writing. Even Aardman Animations are doing the same! In science, we are learning about magnetism and forces – vital in space travel. You can find out more and watch clips here. In history, we’ll be finding out about an ancient civilization – Ancient Sumer. We’ll be trying to answer the question – were the Sumerians the greatest inventors of all time? They were the first people to study the night sky, noting the position of the stars, planets and the phases of the moon. Without them, perhaps there would have been no space exploration! You can find out more about their amazing inventions and play games at the British Museum’s website here. Try writing your name in cuneiform, the world's earliest writing here. We really enjoyed sharing all our learning with our families and the school at our Class Worship on 28 March. Take a look at us performing the poem "My neighbour is an alien" by Maria Francis. Our D&T project this half term has been bridges. We have looked at the forces that act on bridges, compression and tension. Then we considered how bridges can be strengthened by the use of truss systems and arches, learning just how strong triangles can be. be constructed using only paper and tape. Bridges were designed and the school’s sticky tape supply was seriously depleted.! All the paper used was from recycling boxes throughout the school. We tested how strong the bridges were with cans. The strongest bridge held 8 cans (about 3 ½ kg)! It was great fun making the bridges and we all persevered and collaborated really well! Although no prehistoric cave paintings have been found in the UK (yet! ), they are found throughout Europe. We became ancient artists for the afternoon, painting with sticks and even our fingers. It was more difficult than we thought but we all persevered. Take a look at our fabulous cave art. Can you work out any messages in them? On Friday 15 March, in the afternoon, the whole school had a fantastic time sharing our favourite books with each other. We even got to read in our pyjamas! Take a look at our favourite stories and fabulous nightwear! We have started this half term studying books which have "strange" neighbours in them. "I'll take you to Mrs Cole" by Nigel Gray tells the story of a boy who is threatened with a visit to Mrs. Cole by his working mother whenever he doesn't get his jobs done in her absence. He finally searches out the woman on his own and finds out what "awful" things really happen at her house. In Roald Dahl's final book, "Esio Trot", retired bachelor Mr. Hoppy is hopelessly in love with his neighbour Mrs. Silver, but she is only interested in her pet tortoise Alfie, until Mr. Hoppy hatches an audacious plan to win her love. Visit the BBC Bitesize site here to find out more. Watch the clip below about the New Stone Age (Neolithic) in Britain. On 14 February, we visited the Singh Sabha Gurdwara in Bradford. We were shown the Langar Hall and the Darbar Hall, where we heard the Guru Granth Sahib being read. Narinder, our guide, played the sarod (an Indian traditional instrument) for us which we all thought was beautiful and peaceful. We also had a go at tying turbans! We learned a lot about the role of the Gurdwara in the Sikh community and that people of all faiths are welcome to the Gurdwara. We all enjoyed our visit and learned a lot more about Sikhism. Thank you to Mrs Abel, Mrs Brooks and Mrs Sanderson for accompanying us. In PE, we have been creating our own games. Working in pairs and in groups of three or four, we have had to work cooperatively and creatively, with a set choice of equipment. We have had to devise our own rules and we worked together to make our games more fairer, safer and challenging. We have been inspired by a hero of modern art: Henri Matisse. We looked carefully at his cut-out figures and created our own dancing figure by 'painting with scissors'. We took a risk by not drawing an outline; we just cut out the shapes. We used complementary colours in our collages. Can you spot cool colours: blue, green or purple? Can you spot warm colours: red, orange or yellow? Take a look at our fantastic collages below. Happy New Year! What a great way to start 2019 by entering CS Lewis' magical world of Narnia! His book, "The Lion, the Witch and the Wardrobe" has inspired writers such as Philip Pullman and JK Rowling. "I found myself thinking about the wardrobe route to Narnia when Harry is told he has to hurl himself at a barrier in King's Cross Station – it dissolves and he’s on platform 9 3/4, and there’s the train for Hogwarts." JK Rowling. It has also inspired many film makers. Take a look at the most recent film version below. In geography, we'll be finding out fascinating facts about mountains and about some of the people who've attempted to climb some of the world's most dangerous and awe-inspiring peaks, including George Mallory, Sir Edmund Hillary and Tenzing Norgay. Watch Steve Backshall swap wrestling snakes and crocodiles for training to climb a mountain in Switzerland called the Eiger - German for 'ogre'. The Eiger's North Face is 1,800m high and features lots of smooth rock faces and ice waterfalls. In RE, we have been thinking about the stories and beliefs of different festivals as well as finding out how believers celebrate festivals in different ways. To begin our thinking about the Jewish festival of Pesach (or Passover) we created a conscience alley for the Pharaoh of Egypt and Moses, who led the Israelites out of Egypt. We gave reasons why the Pharoah should free the slaves or why he should keep them. "Pharoah" had to weigh up the arguments and decide what to do. We then gave "Moses" reasons why he should continue to follow God's will or why he should forget it and leave the people as slaves. In the end, Pharaoh decided he would free the Israelites. Moses decided to keep following God's will. Phew! This half term, we have been building up our strength and stamina in PE. We've been doing a variety of exercises for a minute at a time, aiming to improve our scores each week. We've enjoyed circuit training and all of us have managed to improve how many repetitions we completed in a minute. Take a look at us in action below. Our new half term began by taking part in the BBC's Remembrance Live lesson, along with Classes 4 and 5, on Friday 9 November. The lesson featured the author and poet Roger Stevens who helped us compose haiku poems to remember all those who gave their lives in The Great War. We were able to join in with a collective moment of reflection ahead of the weekend's national commemorative events. In history, we will be trying to answer the question: "The First World War only affected men: true or false." You can find out more about what life was like in Britain 100 years ago at the BBC Schools website here. We will also be reading Michael Morpurgo's fantastic book "The Butterfly Lion" which links to our learning about World War One. Take a look at the author reading from his book below. Below is an overview of our learning this half term. Towards the end of this term we will be preparing for the Christmas Carol Concert, and it will be great to see you all there on either Monday 17th December or Tuesday 18th December. As always, if you have any queries or concerns, please do not hesitate to have a quick chat or arrange a time to meet. To tie in with our magical, mysterious curriculum theme, Class 3 have designed their own dragon and its habitat. We've worked hard at creating different tones in our paintings. We've also been inspired by Andy Shepherd's book "The boy who grew dragons" as well as Jackie Morris' book ""Tell me a dragon." Take a look below at our fantastic landscapes and dragons. 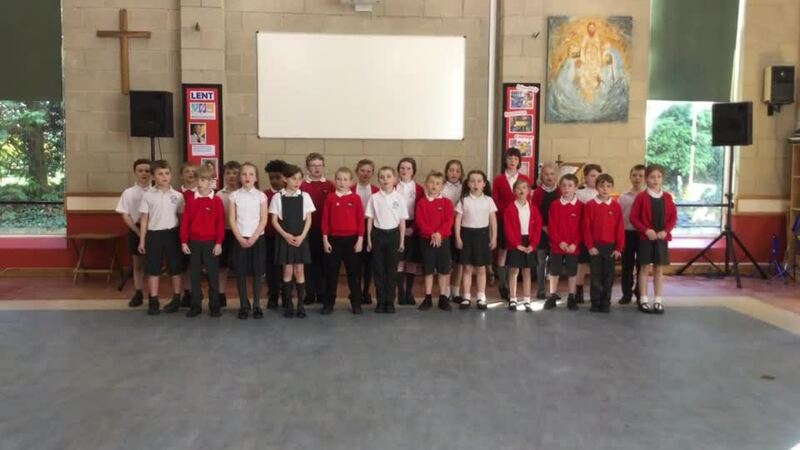 We also performed the poem "The Dragon who ate our school" by Nick Toczek in October's Celebrating our Work assembly. Take a look at our class performance below. We were lucky to have a Street Dance coach this half term. 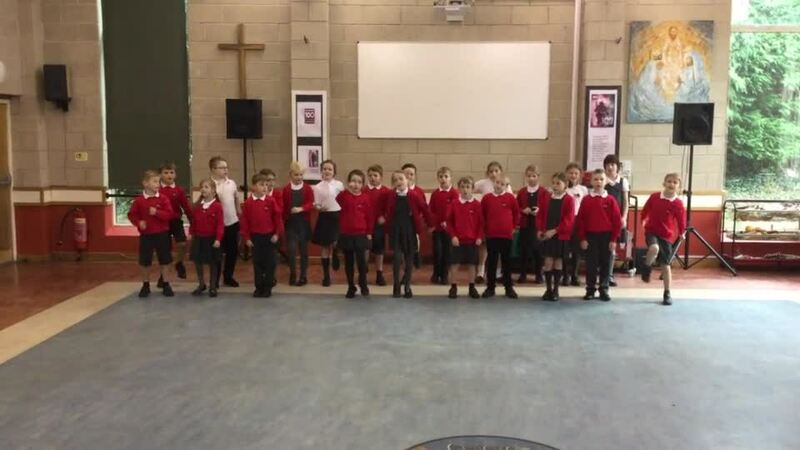 Together, we had great fun creating a whole class street dance! In RE, we have been exploring the question "What do Christians learn from the creation story?" We've also thought about the Christian concepts of Creation and Fall and where in Genesis 3, Adam and Eve are tempted, disobedient, pass the blame and even hide from God! We hot-seated Adam, Eve, the snake and God's spokesperson to ask questions about their choices and the consequences of their actions. Welcome to Class 3! We have had a magical start to the year, diving into the wonderful world of Roald Dahl's books. You can find out more about the life of Roald Dahl and his marvellous stories here. Watch some CBBC presenters explain which Roald Dahl book is their favourite below. As a part of our science learning, this half term we will look at light. We will find out how light interacts with objects, forming shadows and reflections. We will also be investigating transparent, translucent and opaque objects. You can find out more and watch lots of fascinating clips here. We expect you to read every day! Please make sure an adult signs your reading record each time you read as every Thursday we check your reading record. If you have read at least five times you earn a team point. Ukulele lessons will take place on Wednesdays with Mr Fletcher. We have a set of ukuleles which we share with Class 4 and they are sent home on alternate Wednesdays. It is important that they are returned on Monday of the following week so that they can be used in the lesson. PE will be Dance (with a coach) on Tuesdays and Games on Fridays. We will have PE lessons outside as often as possible so trainers, tracksuit bottoms and a sweatshirt can be brought into school as the weather gets colder. PE kit needs to be in school all half term. We will only send kit home if it needs a wash. Book bags need to fit in our new lockers so LEH KS2 school bags are best for this. In Key Stage 2 the children who like to have a school snack at playtime pay each day. We encourage them to think about the coins they need and if they need any change how much they should receive. Snacks now cost 30p per day. The children can either bring 30p each day, or £1.50 at the beginning of the week in a purse or wallet. They can keep any change in their classroom tray.